Mamma Mia! 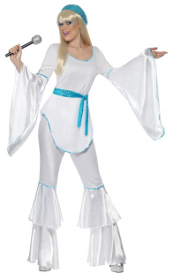 This fabulous ABBA costume gives the impression of a catsuit with the comfort of separates. Wig and microphone sold separately. As famous for their fashion as their music, the Abba Costume train is one you don't want to miss! Wearing white jumpsuit style flares like this is many of their video clips, Abba songs were also performed in the 1994 movie Muriel's wedding, when the lead character wore a white costume like this in a talent show. Many people opt for Abba costumes when they're invited to a retro or 70s theme party, and this catsuit style is an instantly recognisable Abba-inspired outfit perfect for any child of the seventies. Team it with the male Super Trooper Costume for a great couple costume!